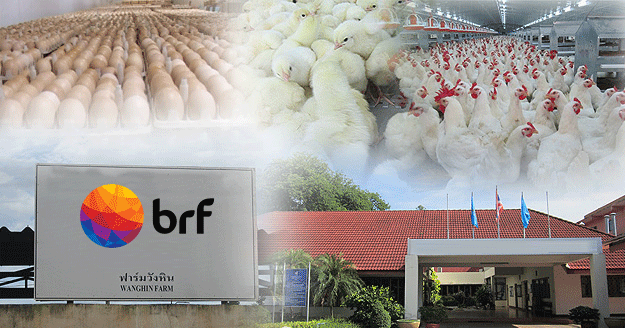 With Food Safety and Animal Welfare a top priority all poultry houses in BRF Thailand are closed environmentally controlled houses suitable for the climatic conditions in Thailand. All of BRF Thailand birds are raised in tunnel ventilated houses with evaporated cooling pads. These state of the art houses ensure the optimal environment for the chickens. The closed house system was developed to ensure the highest quality, hygienic and environment standards for the chickens. All essential and vital systems, such as electricity, water, feed and ventilation on the farms are alarmed for early warning to prevent losses. All the operations in the Agriculture business are managed by competent qualified managers well conversed in Poultry Husbandry with highly skilled services of Veterinary (which includes field services and a diagnostic laboratory), Training and Safety. All the farms are approved by the DLD Standard and adhere to the Red Tractor Farm Assurance Poultry Scheme (Previously known as Assured Chicken Production (ACP), the Red Tractor Farm Assurance Poultry Scheme is now fully integrated into Assured Food Standards (AFS). This ensures that our birds are grown to similar standards as those accepted by the European Retailers.